Larry Summers, The Man Who Always Has Something Interesting To Say, delivered the 2013 Martin Feldstein lecture at the National Bureau of Economic Research on the topic, "Economic Possibilities for our Children." The title is a play on a famous 1930 essay by John Maynard Keynes called "Economic Possibilities for Our Grandchildren" (discussed here). In both cases, the speaker is attempting to look beyond immediate economic distress and consider longer-term trends. Here are a few thoughts from Summers, but the entire essay is short, readable, and worth reading. "At one level, by the way, Keynes did pretty well. He predicted that incomes in the industrialized world would rise eightfold between 1930 and 2030 and they've risen a little more than sixfold so far, so he's looking pretty good on that prediction. But Keynes also got some things wrong. He predicted that as incomes rose eightfold, the workweek would fall to 15 or 20 hours. ... The reason is that people with higher wages now work more hours than people with lower wages. ... Over time, as we have all gotten richer, the number of hours worked for many people has risen." 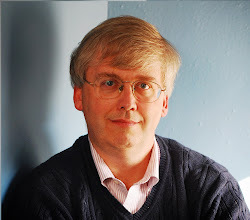 "When I was an MIT undergraduate in the early 1970s, a young economics student was exposed to the debate about automation. There were two factions in those debates. There were the stupid Luddite people, who mostly were outside of economics departments, and there were the smart progressive people, who at that time were personified by Bob Solow. The stupid people thought that automation was going to make all the jobs go away and there wasn't going to be any work to do. And the smart people understood that when more was produced, there would be more income and therefore there would be more demand. It wasn't possible that all the jobs would go away, so automation was a blessing. I was taught that the smart people were right. Until a few years ago, I didn't think this was a very complicated subject; the Luddites were wrong and the believers in technology and technological progress were right. I'm not so completely certain now. ... In the United States today a higher fraction of the workforce receives disability insurance than does production work in manufacturing. (Many workers in the manufacturing sector are not production workers.) ... I think it is also fair to say that the evolution and growth of disability insurance is substantially driven also by the technological and social changes that are leading to a smaller fraction of the workforce working. At the same time, as has famously and repeatedly been noted, the share of income going to the top one percent of our population has steadily increased." "The extent to which differential productivity growth characterizes our economy is, I think, sometimes underappreciated. The Bureau of Labor Statistics normalizes the consumer price indices at 100 in the period 1982 to 1984. 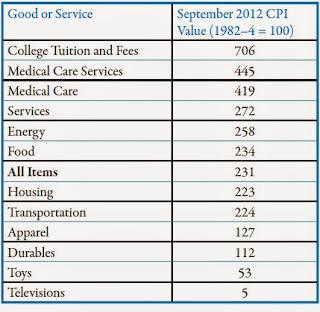 Below are some recent values of the Consumer Price Index (CPI) for 2012. Television sets at five stand out. That is obviously a reflection of a rather energetic hedonic effort by the Bureau of Labor Statistics. One suspects that equally energetic hedonic efforts are not applied to every consumer price. But nonetheless, the simple fact is that the relative price of toys and a college education has changed by a factor of ten in a generation. The relative price of durable goods or clothing as a category and all goods has changed by a factor of almost two in a generation. This table provides a somewhat different perspective on the common and valid observation that real wages have stagnated in the United States. The observation that real wages are stagnant reflects wages measured in terms of the overall consumer price index. But this obscures the truth that real wages measured in terms of different goods have behaved very differently." The table is worth mulling over. 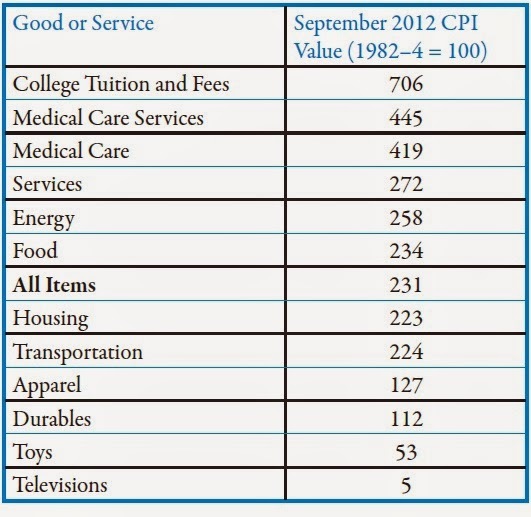 The average price increase for "All Items" from the 1982-84 period was from 100 to 231 by 2012--that is, an increase of 131% A number of categories increased by about that much: Services, Energy, Food, Housing, Transportation. But at the top, college education and health care increased in price by dramatically more. At the bottom, clothing, durable goods (like home appliances), toys, and televisions saw much smaller increases or an outright decline. (The "hedonic" adjustment that Summers refers to means that the government statisticians make an adjustment for the quality of the good--which is obviously necessary if one is to compare a 1982 television set to a modern one.) At some level, the differential movement in prices explains why so many Americans spend so much of their time looking at screens, while worrying about the cost of health care and education.